‘Lips as red as the rose and hair as gold as sunshine…’ These were the instructions I received from my granddaughter with regard to the design of cake she wanted for her 6th birthday. 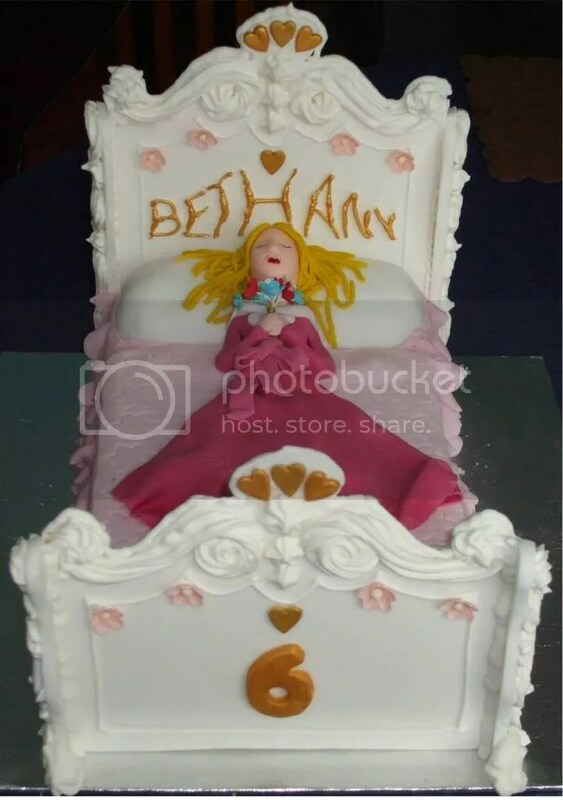 She wanted a ‘Sleeping Beauty’ cake and obviously had in mind the Disney Princesses Sleeping Beauty because she is well into the Disney Princesses. The cake concept was not going to be too much of a problem…but the breathtakingly beautiful slumbering princess…well, that was going to be a toughie!! Surely I could dazzle a six year old girl with a grand, scroll encrusted and gilded bed with frilled and flounced bedding fit for a Princess…and she might not notice the girl herself was feeling a little below par!! Truth to tell – she was not a beauty…she was definitely rather ‘homely’! In fact, I ended up calling her Medusa…which amused the adults but thankfully went over my granddaughter’s head! Still – considering she was all moulded free hand from sugarpaste I don’t think I did too badly! The whole thing was, in fact, edible. The head and foot of the bed were made from sugarpaste and the scroll work was done in royal icing which gave the strength needed to ‘build’ the freestanding bed ends. The gilding was also an edible food colour. All the rest was madeira sponge cake and coloured sugarpaste icing. Just because a thing is edible, however, doesn’t mean that it necessarily should be eaten (…not if you value your teeth in this case because the royal icing was really hard!) 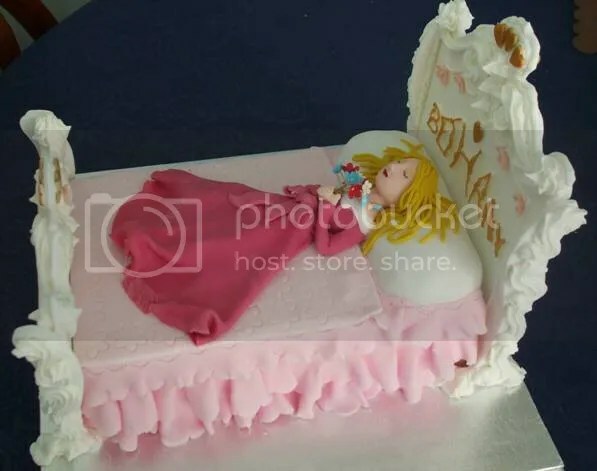 I did think that she might want to keep some bits of the cake – like the bed head and Sleeping Beauty, for a while, as a memento – and sugarpaste does keep quite well so long as it is kept in a dry place. 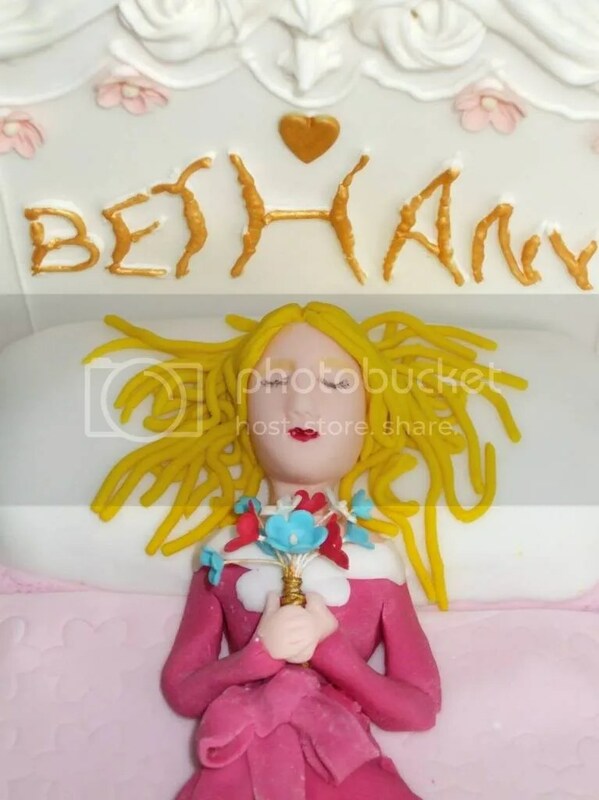 However, talking to my daughter this morning I was told that everyone liked the cake and during the evening Bethany had started eating Sleeping Beauty’s dress….later on the skirt was gone and one of the legs was missing….then there was nothing below the waist. Before bedtime there was a bite mark in the back of her head…and this morning her face had been bitten off!! I’m not quite sure if that means she was just too hideous to leave lying around or that she was just too gorgeous to be left uneaten! !…but there certainly wasn’t any sentimental attachment formed there!! Still, I’m glad her stomach loved her – even if her heart didn’t! !